I thought it would be fun to set my lovely team a little challenge a couple of weeks ago. 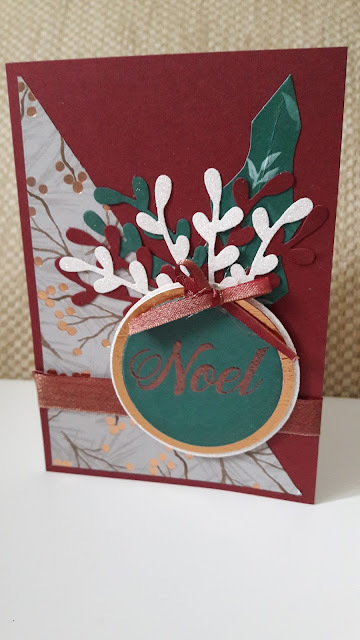 I sent out basic card kits to those wanting to participate which consisted of a notecard and envelope, a piece of Joyous Noel DSP and some card stock in Merry Merlot, Tranquil Tide and Copper foil card, Sparkle, Glimmer Paper and ribbon. 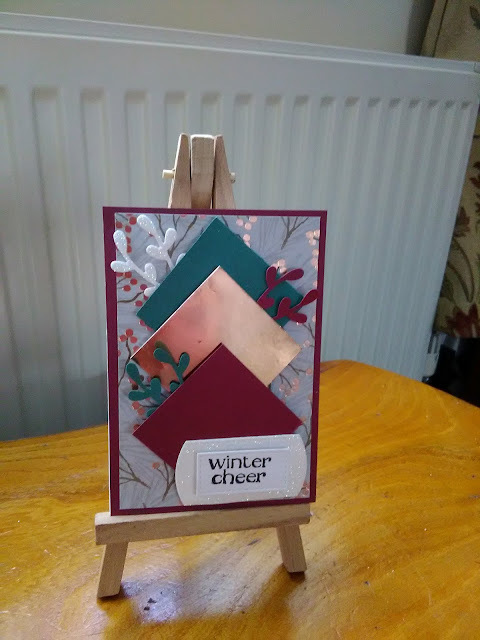 The challenge was to use what I sent them, or elements of the kit together with current stamp sets/bundles/punches/dies of their choice to create a Christmas Card. Some of the team are new Demonstrators and have yet to add extensively to their crafty stash, so a few retired products have been used. This does not detract from the fact that they have made some very gorgeous cards which I am very proud to share. This was my entry for challenge. I used the Stitched Shapes and Layering Square Framelits, Lovely as a Tree stamp set, the Spring Punch and Itty Bitty Greetings. This card is by Shelley Pizzey. Shelley is an Independent Stampin' Up Demonstrator from Great Bentley in Essex. Shelley chose to use the Sprig Punch, Layering Ovals and the sentiment is from the Star of Light stamp set. 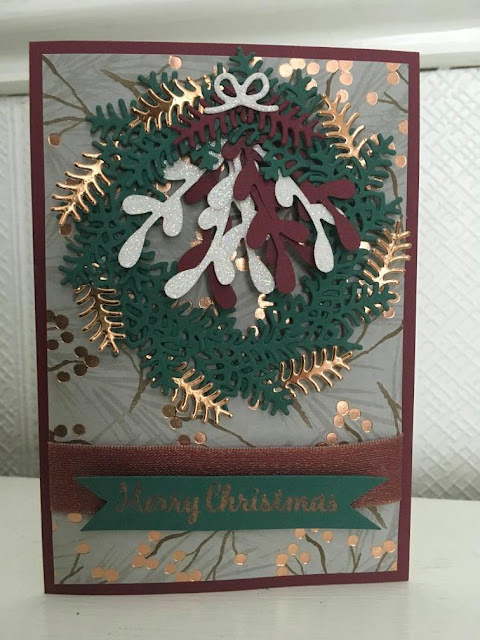 This card is by Linda Brown whose team Leader is Wendy Porter. 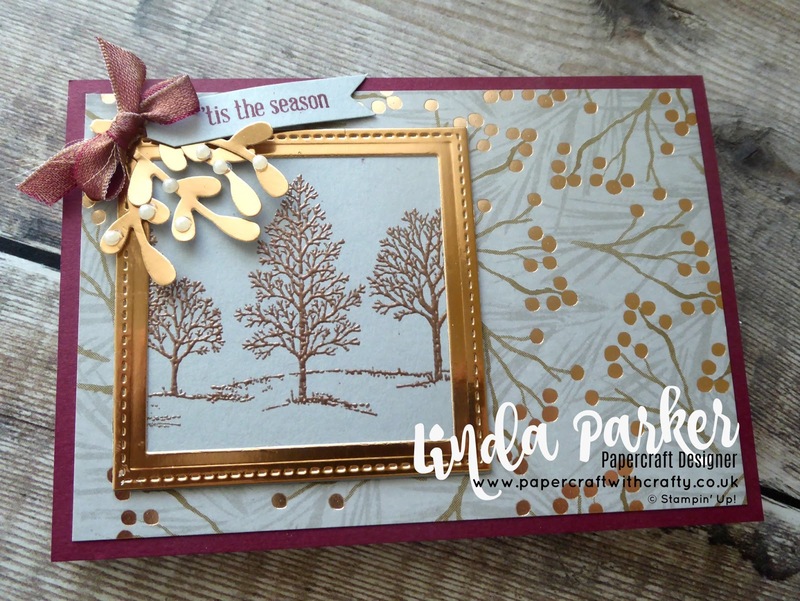 Linda is an Independent Stampin' Up! Demonstrator from Winkleigh in Devon. She has used the Sprig Punch, Layering Circle Framelits and the Christmas Traditions Punch Box stamp set for her pretty entry. This card is by Jeannette Baker whose team leader is Wendy Porter. Jeanette is an Independent Stampin' Up! Demonstrator who is based in Torrington, Devon. She has used the Sprig Punch, and has used the Layering Square Framelits to great effect. The sentiment is from the Spirited Snowmen stamp set. 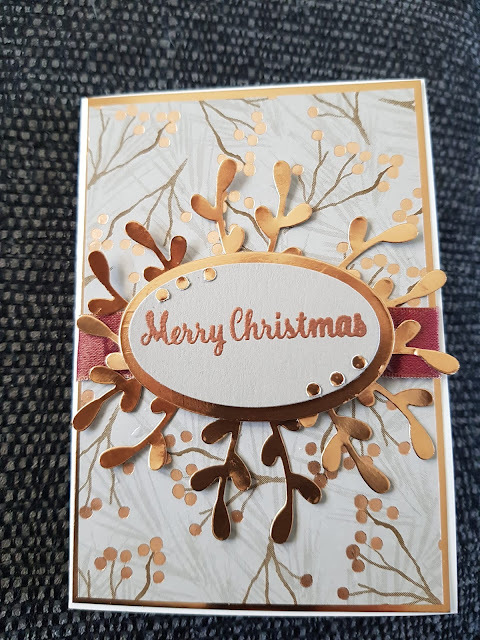 This card is by Val Peacock. Val is an Independent Stampin' Up! Demonstrator based in Bideford, Devon. 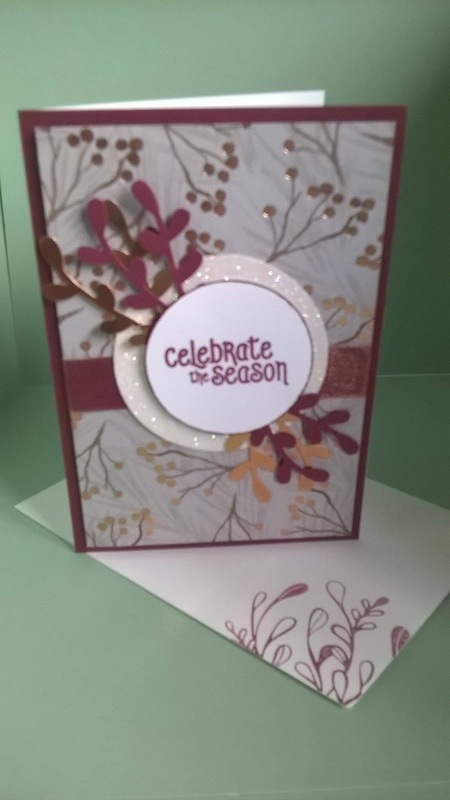 For her card Val used the Sprig Punch and her Mistletoe Season stamp set. She also stamped her envelope. It's a lovely added detail (I love to see stamping on envelopes). This card is by Diane Aylett. Diane is an Independent Stampin' Up! Demonstrator based in Dover, Kent. 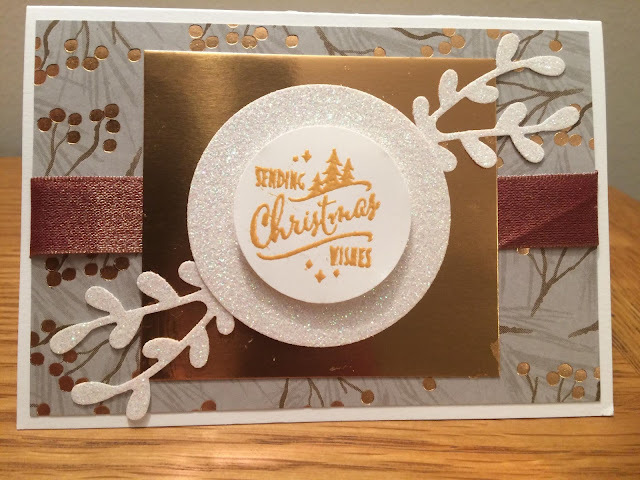 For her card Diane used gorgeous Subtle Dynamic Textured Embossing Folder, Layering Circle Dies, Peaceful Noel and the First Frost stamp sets. She stamped the envelope too ! This card is by Madeleine Messenger. Madeleine is an Independent Stampin' Up! Demonstrator from Plymouth in Devon. Her card uses the Sprig Punch, the Layering Circles Framelits and the stamped sentiment is from the Peaceful Noel stamp set. Madeleine has also used her creative flair to create a background holly leaf ! This card is by Jennie Oates. Jennie is an Independent Stampin' Up! Demonstrator who is based in the Wirrall, Merseyside. Jennie used the Sprig Punch. 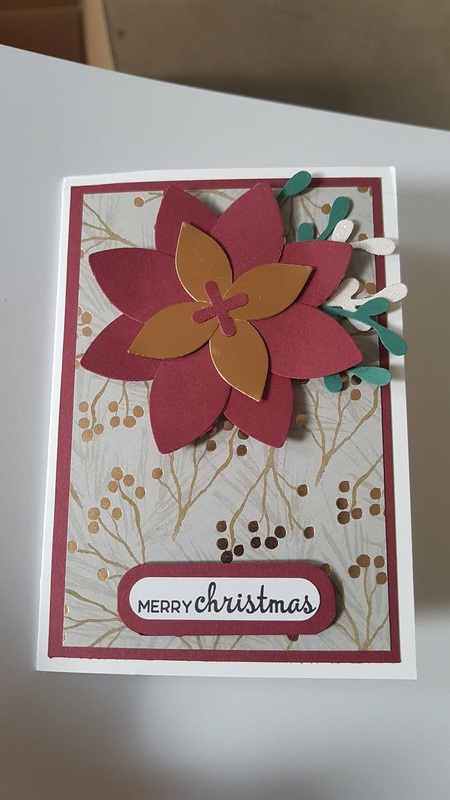 She has also used the retired Festive Flower Builder Punch to create the pretty Poinsettia. The sentiment is from the Beautiful Baubles stamp set. This pretty card was created by Charlotte Stewart. Charlotte is an Independent Stampin' Up! Demonstrator who is based in Dunoon in Argyll. She added a pretty wreath using elements from the Christmas Staircase Thinlits Dies. 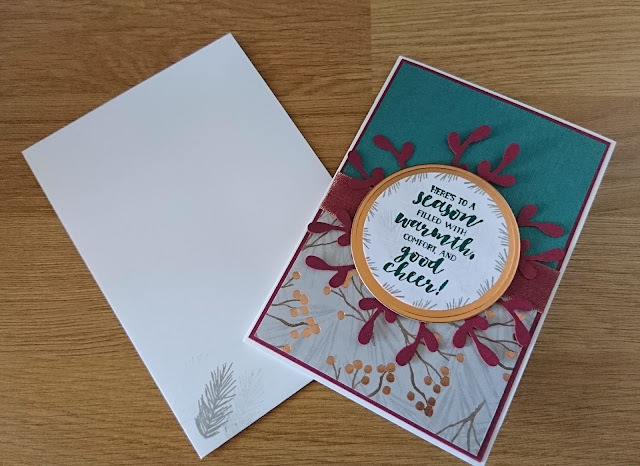 I do hope that seeing the different cards using the same basic card stock and papers helps to give you inspiration to go away and look at your own Christmas stash to see what you might come up with. Thanks for looking and I hope you have a lovely relaxing Sunday.